The Resisters by Eric Nylund. A Resisters Novel. 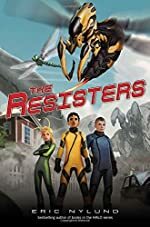 Review: Halo author and game developer, Eric Nylund, has created a new series that will astound missle grade readers - The Resisters. The Resisters is the first book in the series. Ethan Blackwood has finished his soccer game and is at his victory party. He is taking care of garbage when the milk truck pulls up next to his house and the people inside abduct him. When he wakes up, he realized they have taken him into a camouflaged base inside the mountain. Everyone puts on big robot suits, and although Ethan doesn't want to, he does just in time - because a huge robotic spider comes smashing right into the mountain. Then suddenly Ethan is lifted up off the ground and thrown off the cliff. He doesn't think that he can fly, but he hopes he can and wills the bug to do something and suddenly it sprouts wings. It is a wasp. He flies back to town, crash lands and goes home. In the morning he is taken away and sent to boarding school. On the bus ride he finds out that all the parents are controlled by aliens. In fact, everyone past puberty is controlled by them! So, he realizes that it is up to the kids to destroy the mother ship. He breaks out and runs to the wasp. He makes a quick stop at his house, but his family is gone. Will he find his family? Is he going to save the world alone? The Resisters hooked me right at the beginning and it is great all throughout it. My excitement grew and grew with every page. Everything was great about it. It has everything a book should have - awesome characters, thrilling suspense, and a meaningful plot. It is hard to pull yourself away from it once you get started. There is a surprise around every corner and you can never guess what is going to happen next. This is one science fiction book you will definitely not forget. In fact, you'll be anxiously awaiting the next book in The Resisters series! Review written by Carson (7th grade student). We would like to thank Random House for providing a copy of The Resisters for this review. Have you read The Resisters? How would you rate it? nice review sounds like an amazing book!